Such a gritty, realistic cover! Hannah believes she's being brought from Moldova to Los Angeles to become a nanny for a Russian family, but her American dream quickly spirals into a nightmare. The Platonovs force Hannah to work sixteen-hour days, won't let her leave the house, and seem to have a lot of secrets - from Hannah and from each other. This is going to be so exciting! From the first moment I heard about it I knew I'd want to read it. It's sort of the perfect anti-Valentine's Day book, so if you're sick of all the loveydoveyness this week you should definitely stock up on books like this! It tackles a topic ripped straight from the headlines, bringing real-life horror to its pages and readers in a way that is definitely not for the faint-hearted. The cast of character look set to strike us at our very core - the villains, particularly Paavo and Lillian, represent evil at its purest; Hannah is a believable and sympathetic protagonist, but she is also strong-willed and determined to escape her dire situation. And just to make it reach out to you even more, there is even a nice boy for you to fall for. However, he's not the typical drop-dead gorgeous, save-the-day YA hero - of course he isn't, in a book like this, and before you start getting ideas, no, he's not the bad-boy turned good who could be Hannah's risky way out. Colin is a normal American teenager who has problems and insecurities of his own. His frustrations with his parents contrasts with Hannah's constant struggle to keep her mind and body intact. He provides secret friendship and romance, but as the plot thickens and the tension heightens you know love isn't going to make everything okay for Hannah. I'd watch out for this one, guys! 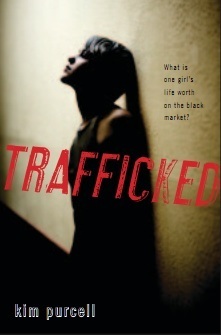 NB: this book is definitely not be appropriate for younger teens, as it contains themes of human trafficking and modern slavery, scenes in brothels and of abuse, and general other content that should only be read by the over-15 age group or very mature readers.